While the game of golf doesn’t have an official uniform per se, there is a specific type of attire that comes to mind when people think of the sport. Golf was once considered a game for the elite. Many of those old traditions carry over even today. The game requires good etiquette. A big part of that is what you wear. When you’re dressing for your day on the golf course, your pants should reflect the decorum of the sport while keeping you comfortable. Golf pants should allow you to move freely so that you can play to the best of your abilities. With all that being said, don’t be afraid to express your own personal style. By dressing in a way that makes you feel good, you’ll have the confidence to let your abilities and technique shine. Here are some of the best golf pants for comfort and style. These pants from Adidas are a sporty option that still has a sense of refinement. They have a slim-fit cut that’s catered to gentlemen with a leaner build. They have a flat front and are tailored to be smooth and minimal. To give you a full range of motion, the pants have Pure Motion stretch technology. The pants are also ventilated to help control sweat and keep you comfortable even on the hottest day. They’re made from 100% polyester and come in a range of muted and bold colors. The signature Adidas stripes are located on the back pocket. 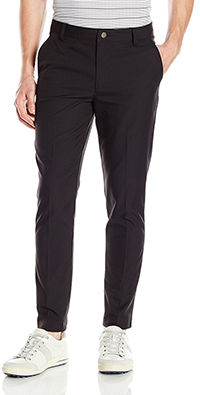 From Nike, these Flat Front pants are a great option that can compliment any guy’s body type. They have a comfortable fit that’s not too baggy and not too tight. They fit nicely and don’t bunch up as you move. The pants are made from a blend of 95% polyester and 5% Spandex. This makes it easy for the pants to stretch as you move. To ensure that you stay comfortable on the course, Nike has included their Dri-Fit technology. It’s breathable and light. With a number of different colors available, you won’t have a problem finding an option that suits you. If you’re looking for a pair of versatile pants that can serve you well in a number of different situations, you should consider this option from Under Armour. The simple and polished look works well in the office as well as the golf course. Made from 100% polyester, you’ll have plenty of stretch to stay comfortable. Even the waistband is stretchy to ensure that you have full motion and comfort. The woven fabric is also designed to keep you dry. Air can flow easily through the fabric. Sweat is wicked away and dried up fast. Another great option from Adidas, these pants are built to keep you comfortable while withstanding whatever the golf course throws at you. Made from 94% polyester and 6% elastane, the pants are stretchy enough to give you a complete range of motion. One unique thing about these pants is their water-resistant design. Moisture slides off the fabric to keep them clean and dry. They’re also very breathable. Micromesh pockets promote airflow throughout. To keep you looking sharp throughout the day, the pants also have silicone shirt grippers that prevent your shirt from getting untucked. Make a bold statement with these pants from Puma. They’re available in a collection of bright colors like green, red, and blue. Beyond their cool appearance, these pants are tailored to give you a sharp look and immense comfort. They’re slim throughout the thigh and taper at the ends. The 100% polyester fabric also has noticeable mechanical stretch for flexibility. A V-notch on the bottom hem accommodates your golfing shoes without having to worry about bunching. Puma also utilized dryCELL technology to pull sweat away from your skin so that you stay dry throughout the day. 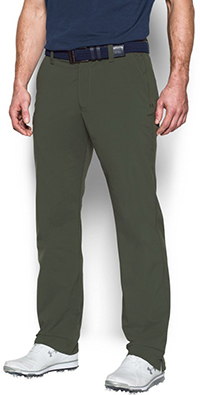 The golf pants from Oakley have a classic look that looks great on any guy. The fit is snug enough to make you look sharp but relaxed enough to not constrict your legs and limit motion. They’re made from 94% polyester and 6% Spandex for stretchiness. The fabric has 4-way stretch so that you have complete freedom to move as you need while you swing. The fabric also helps to manage sweat. It wicks up moisture fast so that it’s exposed to the air and dried quickly. The pants feature flat front pockets to eliminate bulk. They’re available in five different neutral colors. These pants from IZOD are classic and conservative. They’re available in a number of neutral colors. When it comes to fit, these pants are made to accommodate men of all sizes. The straight tailoring falls nicely on the legs. While it doesn’t have any stretch to it, the slacks have more room in them to give you flexibility and motion. The waistband has large loops to fit wider belts. There’s also two front flat pockets and two Welt back pockets. What Makes Golf Pants So Special? While you may not realize it at first, golf pants are tailored and designed with golfers in mind. In terms of comfort, they don’t constrict movement like other types of pants would. They provide enough room for your body to go through the necessary motions. Most golf pants also utilize breathable fabrics that can help keep you cool. They promote airflow and help to keep the sweat at bay on a hot summer day. When it comes to style, golf pants also have a distinct look that sets them apart. They’re shaped to follow the contours of your body. They include sharp creases and specific tailoring. They’re made to fit your body the right way. Not only does this make you look more polished and refined, but it can also do wonders to your performance. This can’t be stressed enough. You need to pay attention to how golf pants fit you before you hit the course. Do a bit of exercise in them. 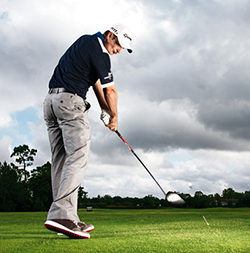 Take some practice swings and see how they feel throughout. A high-quality pair of pants won’t give you issues. Avoid things with pleats and excessive bunching at the ankles. If you do need to use a belt to get a snug fit, go with something that matches your pants. Typically, neutral black or brown leather belts don’t work. Instead, go with a complementary or contrasting color in an open weave that promotes airflow. White is a neutral color that goes well with just about anything. It’s light, outdoorsy, and looks great on the course. White pants always look sharp. If they fit well, they can give you a very polished look. They can also help to keep you cooler than darker pants. One thing to weary of is staining. For the most part, you won’t have to worry about excessive dirt unless you hit the ground often. If you’re one to send dirt flying, you may want to avoid white until your skills improve. If the sun is blazing above you, stick with options that can help manage sweat. Not only is excessive sweat unattractive, but it can also hinder your performance. Luckily, many golf pants have built-in features that keep you dry. Breathable fabrics promote airflow. Some also have moisture-wicking features that pull sweat away from your legs so that they can evaporate quicker. Others have mesh hidden within the pockets to circulate air. All of these features are must-haves when it’s hot out. Most of them are hidden discreetly, so others will be none the wiser. There’s no bigger fashion faux pas than completely ignoring how different clothing elements work as a whole. Because golf shirts are often bright and somewhat loud in appearance, it’s more important than ever to match your clothing items together. Your shirt and shoes should work together with the pants. If you have a brighter shirt, go with something muted. This contrast will offset the in-your-face style of your top. The same goes for the shoes. Make sure that every component complements one another. Good etiquette and sophistication don’t mean you have to be boring. Many seasoned and professional golfers go with bold pants to represent their personal flair. There are many options in bright solid colors and quirky designs. Just make sure that you offset that bold choice with a muted top to ensure that the outfit works as a whole. Choosing the right pair of golf pants should be about both comfort and personal style. 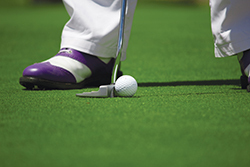 Despite golf’s sophisticated nature, you don’t have to sacrifice your style to succeed.